Brother Gift with "You Have Touched My Life in Many Ways, By Being the Wonderful Brother You Are" Poem. Boats at Dusk Photo, 8x10 Matted. Special Birthday or Christmas Gift for Brother. A special gift your brother will cherish. 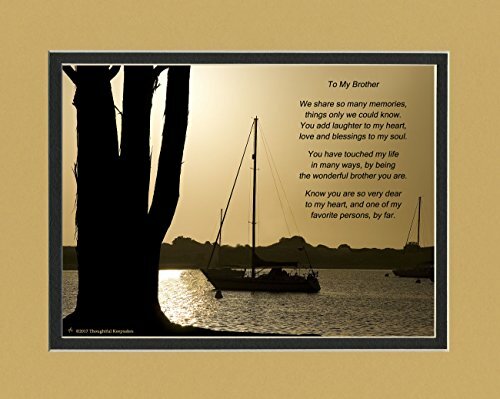 This beautiful photo of a silhouette of a tree and sailboats at dusk includes the poem: To My Brother (above poem) We share so many memories, things only we could know. You have added laughter to my heart, and love and blessings to my soul. You have touched my life in many ways, by being the wonderful brother you are. Know you are so very dear to my heart, and one of my favorite persons, by far. Thoughtful Keepsakes is an independently owned small business that takes pride in our products. The company was started by the owner, Penny, who photographs and designs all the products and now writes most of the poems. We give excellent customer service and a 100% satisfaction guarantee. The photo size is 5 1/2" by 7 1/2" and includes an 8"x10" double mat as viewed. Printed with high quality photo paper and ink. No-frame included. Will fit in any 8"x10" frame that allows space for a double mat but not-a-photo-frame that fits only one piece of photo paper. To view all our gifts by category just put your cursor on "Thoughtful Keepsakes" and then click on our "Storefront". Give a gift that shows "You are special to me" - "You are loved." This gift celebrates not only the special occasion but more important the unique individual. Gifts are exclusive from Thoughtful Keepsakes and the owner photographs and designs all the products and is the author of most of the poems. Made in the USA. The photo size is 5 1/2" by 7 1/2" and includes an 8"x10" double mat as viewed. Printed with high quality photo paper and ink. No-frame included. For other photo or poem choices just scroll to the top and click on Sister, Brother, Cousin Gifts. To view all our gifts by category just put your cursor on "Thoughtful Keepsakes" and then click on our "Storefront". If you have any questions about this product by Sister, Brother, Cousin Gifts, contact us by completing and submitting the form below. If you are looking for a specif part number, please include it with your message. Piano Music Notes Vintage Picture on Stretched Canvas Wall Art Décor, Ready to Hang! Wedding Gift for the Couple with Wedding Blessing Poem. Aspen Path Photo, 8x10 Double Matted. Special Wedding Keepsake for the Bride and Groom. Vintage Monster Trucks Car Crush Bigfoot Vs. Awesome Kong, Boys room Wall art, Photo Decor, Monster truck room, Nursery decor, Kids Room Wall Art. Farmhouse Decor Wall Art Set of 4 Unframed 5x7" Prints, Country Rustic Landscape Photographs. Barn Fence Hay Windmill. Beige, Tan, White.